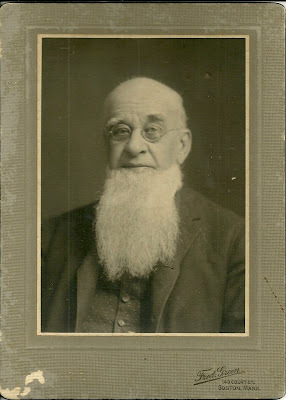 Photograph dated 1909 of an elderly D. H. Clancy of Malden, Massachusetts; taken by Fred Green, 140 Court Street, Boston, Massachusetts. 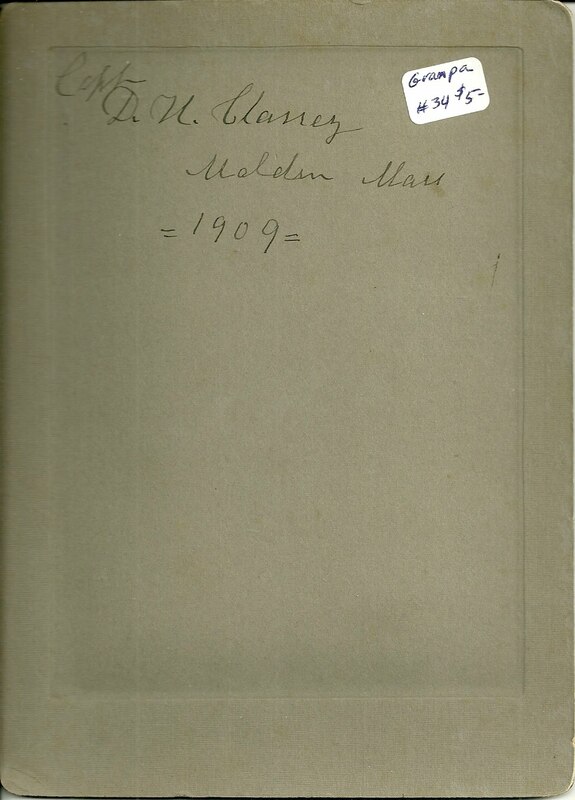 David H. (possibly Henry) Clancy was born 4 January 1836 at Dresden, Maine, the son of David and Elvira (Heath) Clancy. His paternal grandparents were David and Bethiah (Call) Clancy. I haven't yet found any information on Elvira Heath. If my information is correct, David H. Clancy's paternal great grandmother was Elizabeth Goux, whose father Daniel Goux (the surname eventually morphed to Goud, Goude, Good, etc.) came from the Montbeliard region of France to North America and eventually to Dresden, by way of Newfoundland, in the mid 18th century. I found this information thanks to the lucky break that Elizabeth's sister Suzanne married Mark Carney and found her way into a book about the genealogy of the Carney Family. 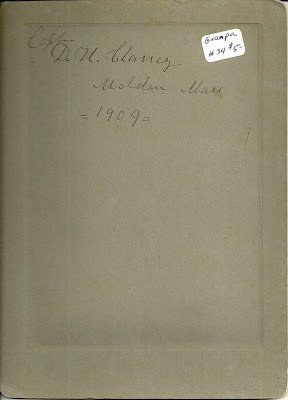 On 9 February 1857 at Dresden, Maine, David Henry Clancy married his wife Ellen. I have no information on her; censuses give varying dates of birth and states of birth. The couple is found in Massachusetts in the Censuses of 1870 and beyond. I found David in the 1910 Census of Malden, Massachusetts, where he indicated he was a widower. In the 1880 Census of Somerville, Massachusetts, David H. Clancy called himself a Provision Dealer. Earlier, in the 1870 Census of Boston, Massachusetts, he indicated he owned a Fish Store. Perhaps therein lies the connection to his sobriquet "Capt." on the photograph. Or he could have been in the military; he was the right age for duty in the Civil War. In the 1860 Census, he's in Dresden with his parents David and Alvira C. (in other places shown as Elvira) and his many siblings; unfortunately, no occupation is listed for him. The couple had a daughter Lillie. She grew up to marry Ernest Newbegin, who was born 17 September 1856 in Boothbay, Maine, the son of George Henry and Ora Caroline (McClintock) Newbegin. By the 1930 Census Lilly was a widow, living in Malden, calling herself a "guest" in a large household of disparate people. I couldn't find a record of any children for this couple. I realize the price label says "Grandpa", but I think that was an editorial comment by the contemporary seller. A discussion of Dresden, Maine, on Wikipedia, with mention of the Huguenots, who were among the first settlers there.